I’m one of the lucky ones. My mom never stressed physical beauty. Once when I was a little girl, I asked Mom what she would do if one of her kids were really ugly. Mom’s brown eyes looked straight into mine, then they jigged back and forth looking all over my face. You know the way Ingrid Bergman looks at the handsome fellow she loves and she doesn’t know if he loves her back, and she’s searching all over his face to see if she can pick up any signs of love. I was a ginger-haired, freckly little girl, in hand-me-down clothes. I never thought about how I looked once I did that first-over in the morning: bed made, teeth brushed, face washed, and hair pulled back in a high ponytail. There was more to me than the eye could see. I thought about that this morning when Lady Romp posted this video of women’s responses to their photo-shopped selves. Like I said, I’m one of the lucky ones. I like my freckles. I like my (faded) ginger hair. I like that my eyes are neither brown, nor blue, nor green. I especially like my smile. Oh, and G-money calls me ‘darty-eyes’ when I give him that Ingrid Bergman look. This is me, no re-touch. I’m sitting at my desk. 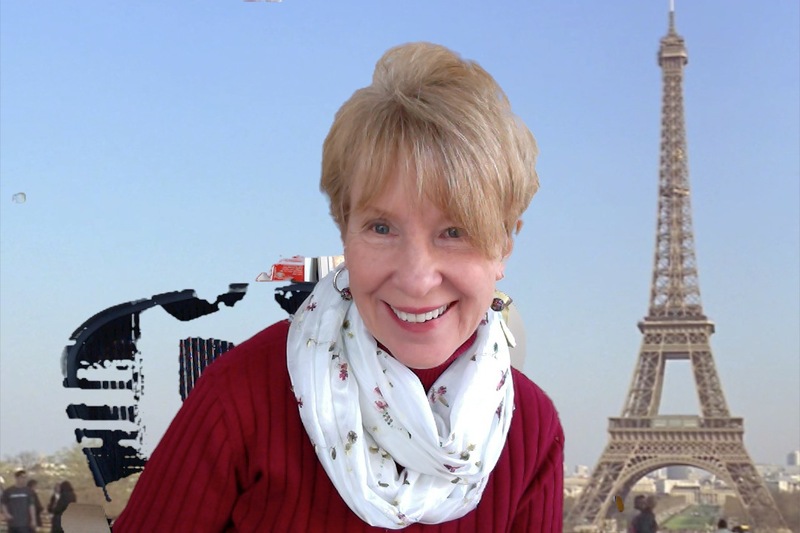 Okay, yeah, I’m photo-bombed by the Eiffel Tower thanks to my “Photo-Booth” app. You’re beautiful, and you look like you belong in Paris! Thank you, Sharon. On the spur of the moment, I went from long (your length) to super-short. I’m still getting accustomed to a bare neck. Funny how the Eiffel Tower made me feel more chic!